Real world STEM lessons are valuable for kids. Choosing to make a difference, find a solution, and step out of the crowd, is so valuable for kids to feel comfortable doing today. Providing real world STEM activities or lessons can provide numerous skills to kids of all ages they can carry with them all their lives. Fill their thinking toolbox at a young age and be amazed at what they will accomplish in the future. STEM is a huge part of our world and we need thinkers, doers, and inventors to make this world a better place. 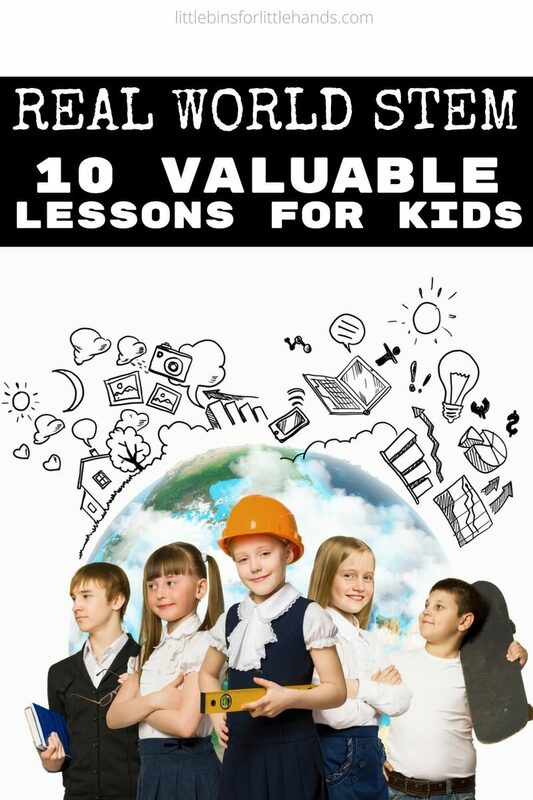 Read on about the 10 ways I believe STEM activities are crucial for young kids to experience. 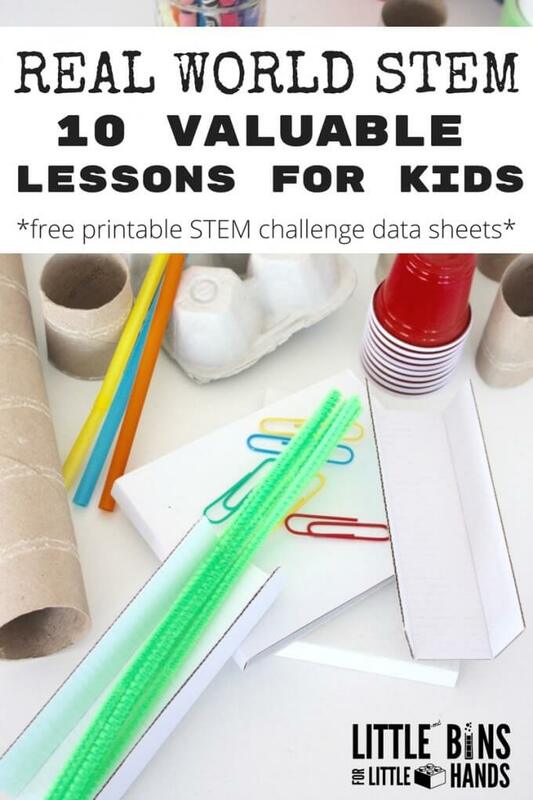 It might seem pretty basic when you read through these 10 ways real world STEM lessons are so important, but sometimes we overlook the basics in a rush to get on to the next thing. 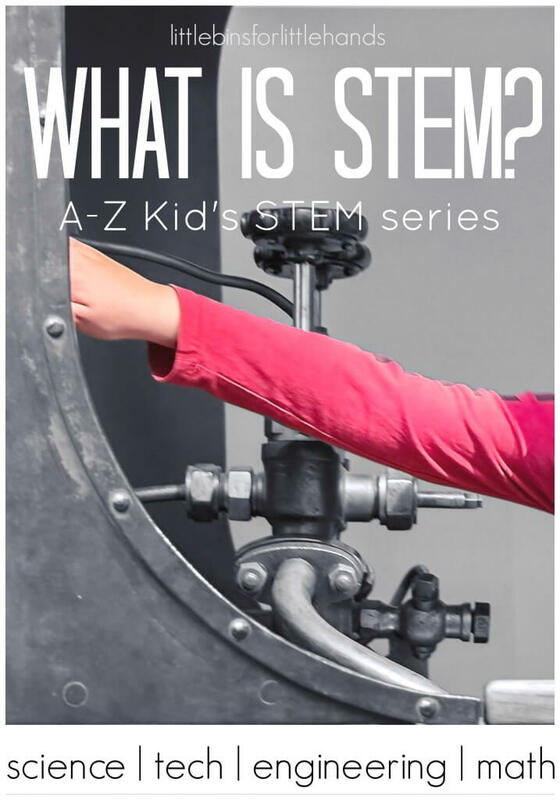 When I first wrote What Is STEM at the beginning of the year I discussed about how our world is going to need a new generation of free thinkers, problem solvers, and inventors to move us forward but also to look for better solutions to our current problems. We need kids who can look around and see what their city, their state, their country, or their world needs and go for it. Get kids out and about, looking and observing. Help lead discussions about what you see happening around you. Encourage them to ask questions to develop their inquiry skills. Ask them what’s the one thing they would want to change about the world and then ask them how they would do that! If you observe a need, you need to find a solution. It’s not enough to point out what needs doing. You have to be the one to do it. We need to encourage our kids to be the ones who stand up and say let me try. Always thinking someone else will solve the problem is all too common. Teach your kids it’s ok to try something even if you aren’t sure where to begin. Observing real world needs is a great first step. Critical thinking is another important one. Encouraging kids to think outside the box and to work without instructions, will lead to great inventions and discoveries. Critical thinking leads us to try new ideas, work in unconventional ways, and take risks. Observing needs, developing ideas, experimenting with solutions encourages an important level of risk taking that many kids want to avoid. We aren’t talking about the jumping off a skyscraper with paper wings type of risk taking. This risk taking is willing to stand up for your idea, make it happen, and if it fails, to try again. Have you been told that when the going gets tough, the tough gets going? Taking healthy risks to solve problems and find solutions to real needs does not go without failure. Failure is a crucial skill kids need to learn how to handle. Failure should set us up to forge ahead, apply those critical thinking skills, and try again. When you are willing to push through failure, you can ultimately find success. Real world issue or needs aren’t as simple as adding 2+2. There can be more than one answer or solution. This is part of persevering through failure as it helps kids to keep an open mind to new suggestions or thoughts even when they had put all they had into that one solution. Real world needs also need communication. Having an open mind, willing to think outside the box, and working through failure has a lot to do with communicating with others. What is working? What doesn’t work? If we change this will this happen? Multiple ideas can come together to find an answer because we learned there isn’t always one definite answer. Communicating your finding and solutions accurately and effectively whether through recording data, writing reports, or giving presentations is key to taking action. Not only will math, science, and communication skills be used, so will the whole process of completing a project from start to finish. The skills to learn how to research, plan, gather data, design, and draw conclusions are vital to the success of kids looking to solve real life needs. When will I ever need this? Have you heard that one? Who knows when you will need that important piece of information to solve the last piece of the puzzle. Though on a daily basis, all those great math and science skills will come in handy and will be needed as your kids work through problems and find solutions. Often times real world STEM lessons will include parts of science and math reinforcing already learned skills in a very useful way! What drives an inventor, an explorer, a scientist, an engineer? Passion. Wanting to find better ways to do things, cure diseases, or builder a safer world hinges on passion. The passion to try and fail and try again and maybe even fail again until the right solution is found. If your kids are passionate about a cause, they will work diligently and eagerly to see that cause through to the end. Passion drives us to do better and greater things but we want to do it. Real World STEM Lessons Are Everywhere You Look. So try out some cool STEM projects and build your own bridges, towers, dams, or ramps and simple machines. 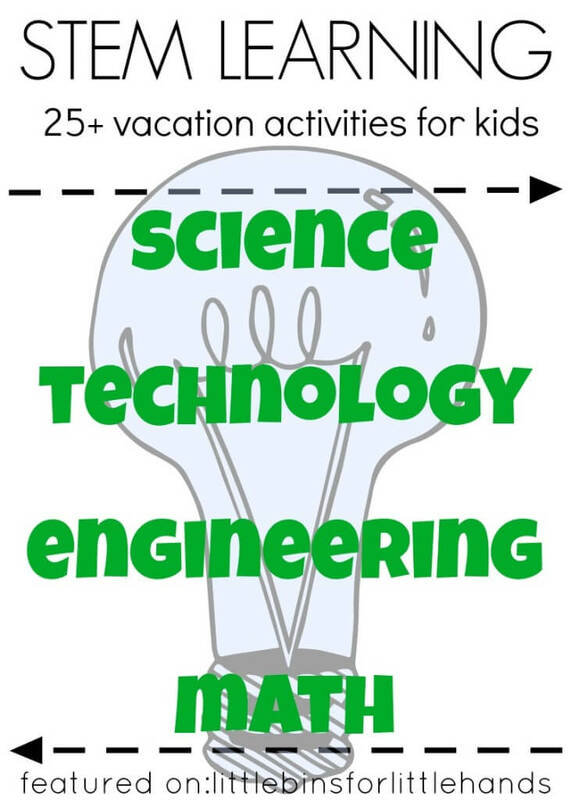 When you are out and about check out how STEM or science, technology, engineering, and math have shaped some of your favorite places and activities. From skateboard parks to wind farms, they all started with an idea and a plan. Most importantly, they all started with a person who wasn’t willing to give up on his or her idea. 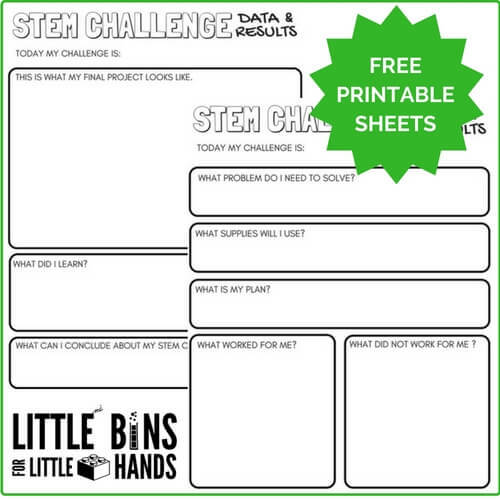 Use our free STEM worksheets for your next STEM challenge. 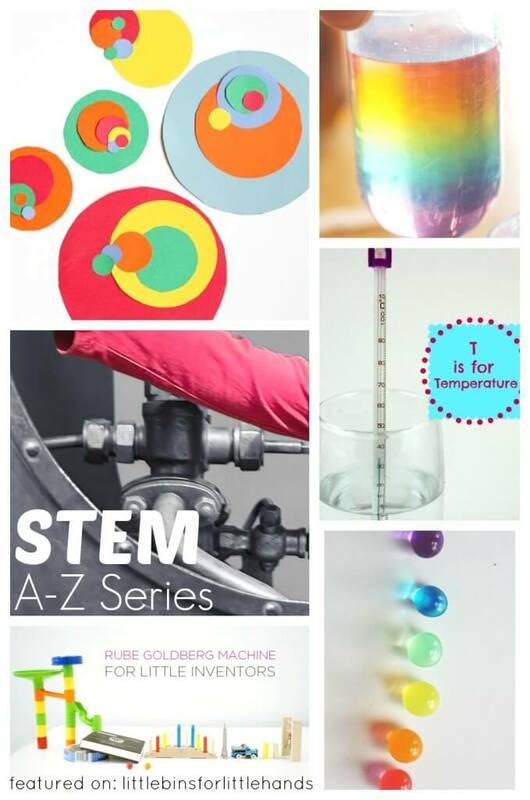 Click on the photos below for more on STEM and cool STEM activities to try at home! Looking for an STEM activity for first grade that involves designing a cooler, something that keeps ice from melting.